The boxes have side handles…….and a front window to slide in a content label. So what kind of stuff do you need organized? Toys? Sewing supplies? Cords and chargers? Diapers and wipes? Toilet paper? Whatever it is……you can always switch it up with the little window that you can slide labels in and out. But what’s keeping those bins nice and upright? Nope, not cardboard (though I did consider that). I slid in pieces of plastic canvas between the layers. 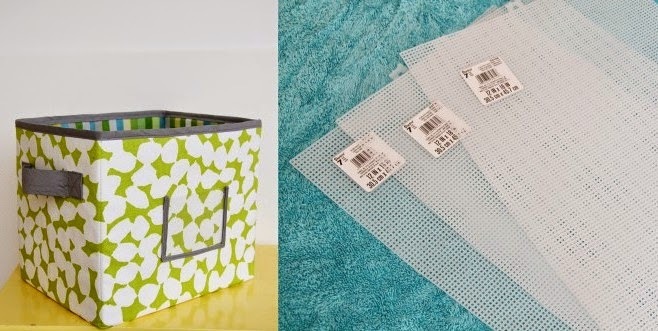 I was actually thinking of using thick sheets of heavy duty plastic but couldn’t find anything that worked as I walked through the craft store. Until I came upon these. Worked like a charm. Anyway, would you like to make some for yourself? 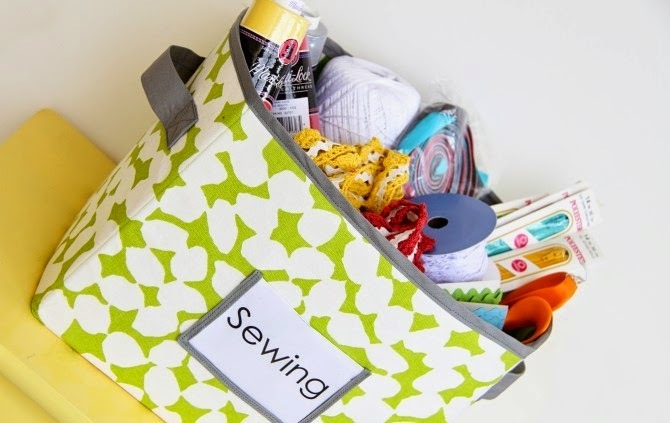 Okay, first off……I bought all of my supplies at Joann Fabric. But you could purchase these items anywhere. The canvas could even be purchased online, I’m sure. But this is the type of canvas I bought. And if you click on it to enlarge it, it says that it’s ultra stiff plastic canvas. 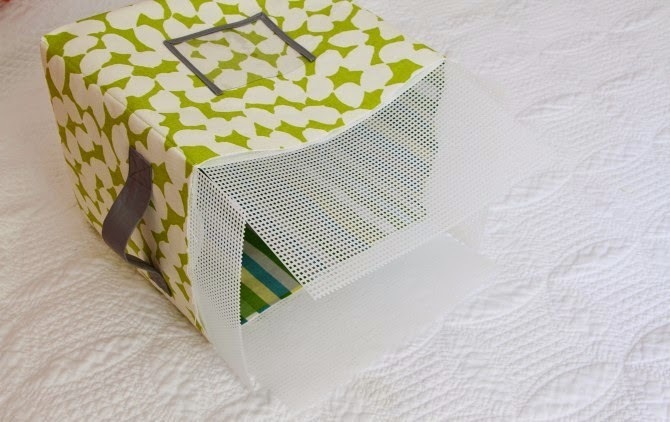 The sturdier the better because you want your boxes to have good shape. The fabric I chose was some home decor fabric. So like a thick fabric that they sell for like outdoor fabrics, or to recover wooden chairs or stools with. But not that super thick couch-like upholstery fabric. That would be hard to work with….and too heavy. To begin, cut out an outer piece and a lining piece of fabric that are both 40 x 14 1/4 inches. Then cut two pieces of fusible interfacing that same size. Then iron the interfacing to the “wrong” side of the fabrics. Then sew both fabric pieces into tubes, sewing the two shorter ends together with right sides together. Use a 1/2 inch seam allowance and you can either zig-zag (and trim) the raw edges or serge them. Do the same thing with the lining piece and set aside. Now, turn the outer fabric tube to the right side and iron the seam flat open. Then fold this fabric tube flat, with the side seam exactly along one side. Then place a pin along the other side, right at the top, just to mark the exact other side of the tube. The side seam will be the exact back of the box and the pin you just placed will be the exact front of the box. Then open up the tube just a bit and fold the tube together again, matching up the side seam with the pin (the blue pin below) that marks the “front” of the box (that you placed in the last step), right in the center. Press the tube flat again, giving you new side edges. Place pins at each end at the top (see the yellow pins?). These are going to be the exact center of the sides of your box. Essentially you just divided the tube into 4 quarters. Next, you’ll be attaching handles on the sides. Cut out 2 strips of fabric that are 8.5 x 3 inches. 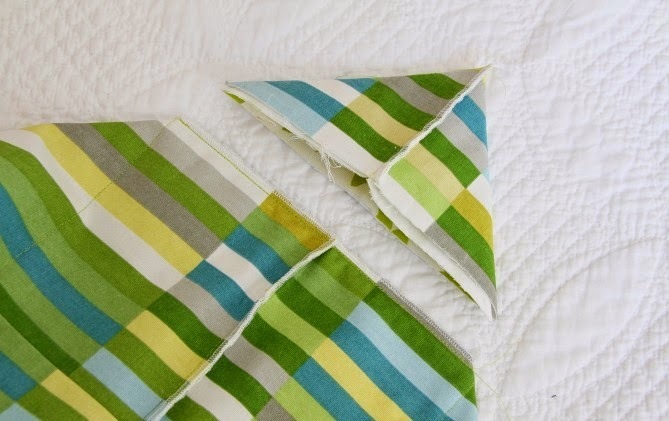 Fold each strip together lengthwise and sew the long edges together using a 1/4 inch seam allowance. Then turn each tube right side out. Iron them both flat with the seam going along the back side. Then fold each end towards the back about 3/4 of an inch. Pin in place. Then turn over and place the handle about 2 inches from the top upper edge, making sure to center the middle the handle right where the pin is at the top edge. And to make the handle bubble out, place the two edges only 6 inches apart. 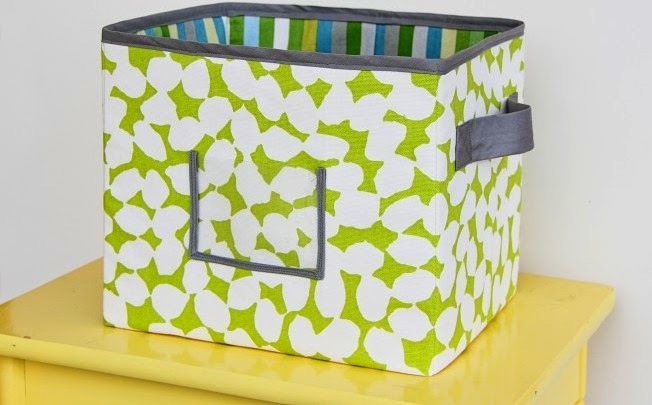 Then sew each end down……making a box with an “X” through it to make it nice and sturdy. Next cut out a piece of clear vinyl (this stuff comes on big rolls at the fabric store) that is 4 1/2 x 3 1/4 iches (or whatever size you want). Then attach some 1/4 inch double folded bias tape to the edges. Then center it on the front side of the tube, right below the pin that you put to mark the center. Place it about 3 1/2 inches below the top top edge. Then sew around the outer 3 edges of the window, attaching it to the main fabric. Now, slide the lining inside of the outer fabric, with “wrong” sides together. Match up the raw edges. Line up the back seam of the outer fabric with the side seam of the lining fabric. Now pin the edges of the outer fabric and the lining together along the top and bottom. 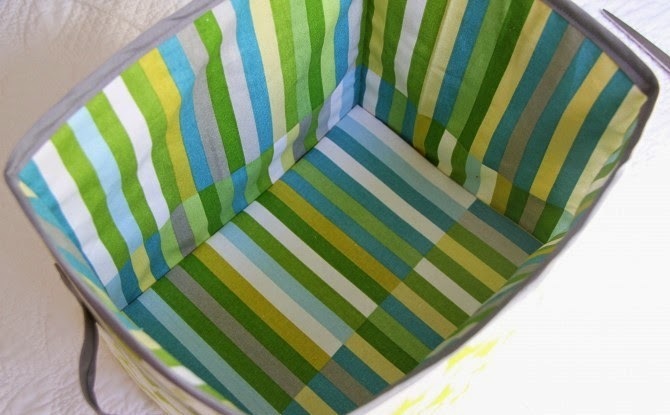 Now place the back of the fabric box towards you, with that seam running right down the center. The front and back of the box will be 11 inches wide. So place a ruler right on top of that seam and line up the 5 1/2 mark (which is half of 11) with the seam and then place a pin at each side, 11 inches apart. (So, at the “0” mark and the “11” mark.) Place several pins down the front of the box, marking this back section. 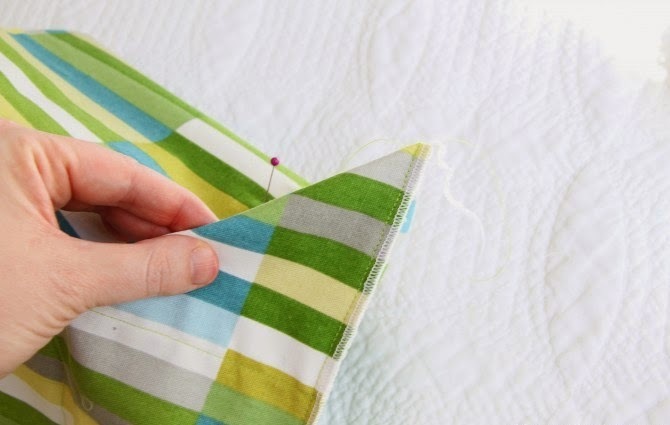 Then connect those pin marks with a chalk line, which is where you will be sewing a line later on. Draw the 2 chalk lines down the back, that are 11 inches apart. Then do the same to the front as well, making sure to center the 11 inch distance below the center pin that you placed on the front of the tube. So now you have 4 vertical chalk lines running down the tube. They are 11 inches apart in the front, which makes them 8 1/2 inches apart on the sides. Now, sew down those chalk lines, only sewing through one layer of the outer fabric and one layer of the lining fabric with each seam. Here’s a view from the side. The orange arrows are pointing to the seams that are 8 1/2 inches apart on the side. And see what you’ve created? 4 little sections that can open up. Now measure up 4 3/4 inches from the bottom and mark with pins. Draw another chalk line (if you want) all the way around the bottom, connecting those pins that are all 4 3/4 inches up from the bottom edge. Sew along that chalk line, all the way around, only sewing through the one layer of outer fabric and the one layer of lining fabric. So, you are sewing one big circle and the tube should still be open. 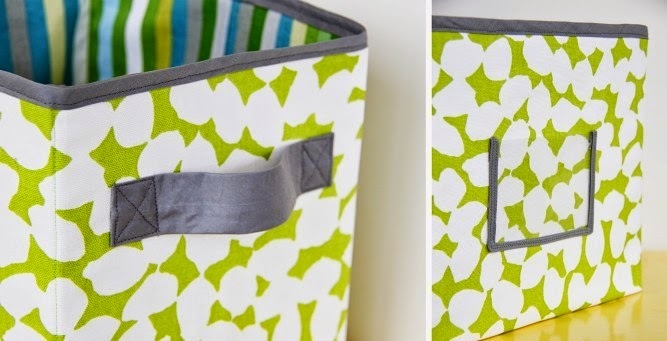 This line just creates little compartments to slide your canvas in later. 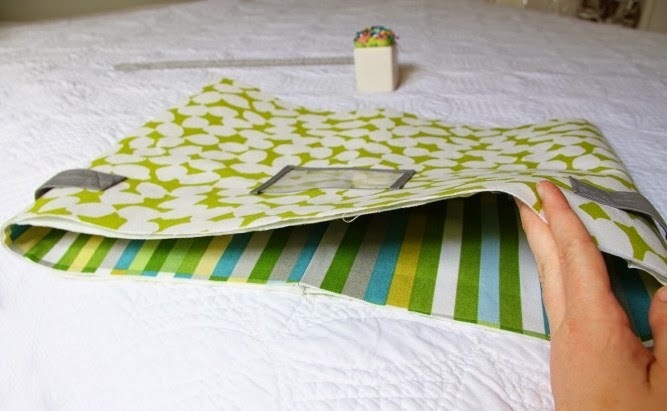 Now, turn the tube inside out with the upper edge at the top and the exact sides right at the sides and the front and back directly in the exact center. (The front and back vertical lines should match up at the top and bottom.) Then sew along the bottom of the tube, using a 1/2 inch seam allowance. 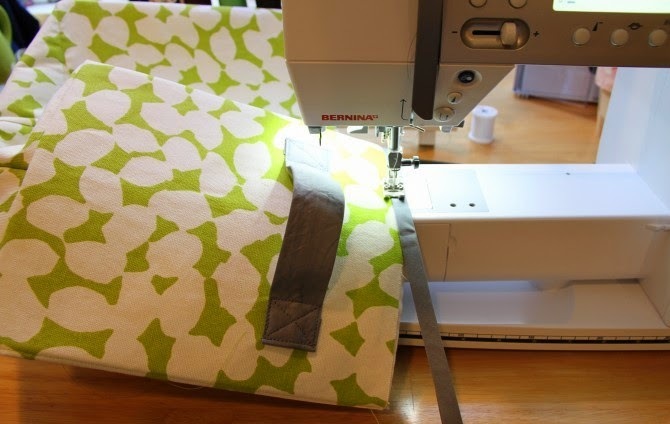 Finish off the raw edges with a zig-zag stitch (and trim) or serger. Now, look at the bottom corners. Place a pin right at the side where that seam (that is 4 3/4 inch from the bottom) hits the side. Now grab the bottom corner and pull the front side away from the back side. Then turn the fabric over on it’s side and make the tip nice and pointy while lining up the seam that’s now running along the top, even with the pin that you placed on the back side. Just feel it with your fingers and line them up. See? Here’s the pin centered on the other side. As you’re folding and adjusting, you will see a horizontal line and a vertical line that cross one another along each side of this triangle shape. They should intersect right along this new fold that you have made. Then sew right along that horizontal line that is already there (which should be about 8 1/2 inches across). If it’s not exact, don’t sweat it. Then cut off the excess fabric and zig-zag or serge the raw edge. Do the same with the other corner. Now you should have a nice square looking bottom. Now, trim your canvas down to the appropriate size, and slide down into each section. Make sure to really slide it down into each side. You want the canvas pieces snug so that the walls of the box have good shape and aren’t floppy. Make sure that the canvas piece is 1/2 inch shorter than the fabric (so that you can add your bias tape). 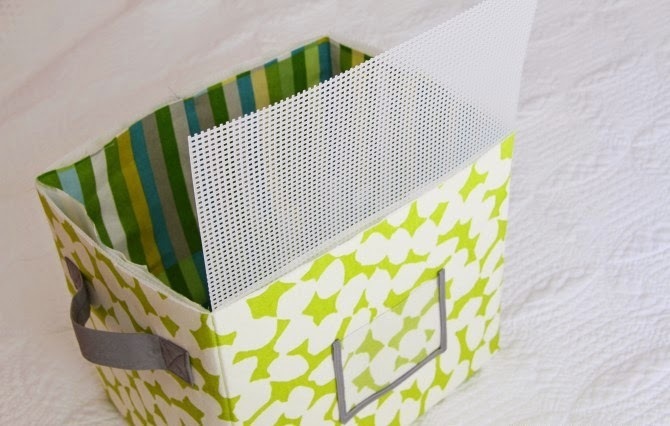 Then, use some 1/2 inch double fold bias tape along the upper edge of the box, adjusting the canvas and really shoving down into each slot as you sew. you will have to start and stop many times to adjust, and that’s okay. Finally, cut 2 rectangles that fit snugly into the very bottom of the box. 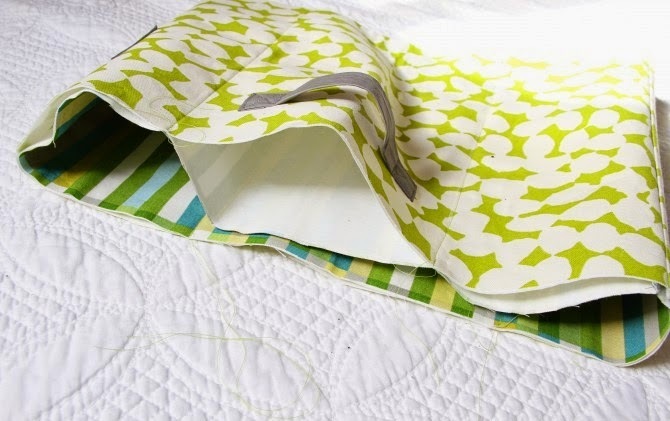 Cut a piece of fabric that is a couple inches bigger around all edges. 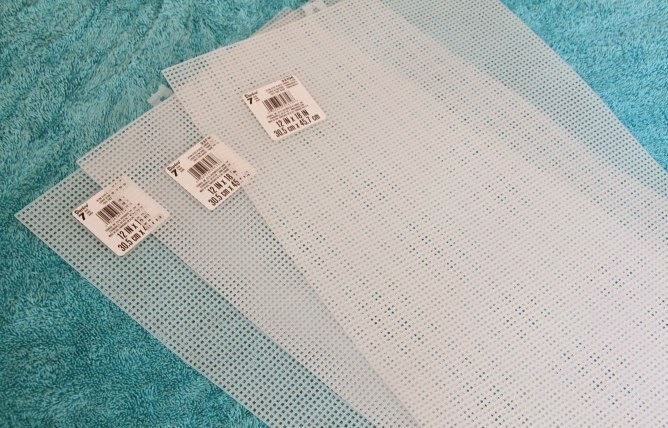 Then use a glue gun to glue the edges around the 2 canvas sheets. Then slide the bottom right down into the box. You can either hot glue it down or just leave it there. It should be snug enough to stay in place though. And that’s it. You are ready to make several more boxes.